LEUCINE could be hailed as one of the most potent natural muscle building supplements known to man.Â ALLMAX brings you the purest and most powerful single ingredient to build hard, lean, dense muscle, fast! LEUCINE (C6H13NO2) is an Essential Branched Chain Amino Acid (BCAA) known throughout bodybuilding as the ultimate muscle-builder. LEUCINE is one of the three branched chain amino acids (the other two being Isoleucine and Valine) and is extremely important to consume dietary sources or supplements to provide the body with this important BCAA. It is naturally found in nuts, brown rice, whole wheat, cottage cheese chicken and fish. Unlike amino acids, which are metabolized in the liver, BCAAs are metabolized in the muscles and are integral for protein synthesis and for preserving lean muscle tissue.Â LEUCINE is one of the most concentrated amino acids within the skeletal muscle tissue. During dieting LEUCINE has been found to be especially helpful for its ability to spare protein degradation. When calories are restricted, the body uses LEUCINE as a source of gluconeogenesis, by supplementing with LEUCINE glucose blood levels can be stabilized as LEUCINE easily and readily converts to glucose.Â In fact, LEUCINE has been found to convert to glucose at a much faster rate than the other BCAAs. THE ALLMAX ADVANTAGE: Our pure, German-Source, Pharmaceutical-Grade LEUCINE crystalline powder is a 100% Animal-Free source! Derived from a pure vegetable (corn), the complex fermentation process yields a clean, white crystalline LEUCINE powder. There are zero binders, excipients, additives or preservatives in our LEUCINE product. ALLMAX did not stop there; we’ve taken the highest-grade LEUCINE available and made it even better. In the final stage of LEUCINE production, the result is a coarse crystalline structure. We’ve taken the raw crystal material and microparticulated through a complex series of processes; the result, a perfect, ultra-fine white powder that has optimal absorption levels. 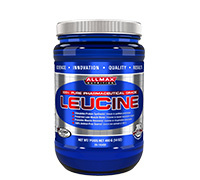 BEWARE OF YOUR LEUCINE SOURCE: While ALLMAX Essentials provides you with the ultimate in high-grade ingredients, there are other cheaper ways to get your LEUCINE. Most LEUCINE, frequently of Chinese origin, comes to you from a source of HUMAN HAIR (typically from barber shop floor waste), DUCK feathers – or both. 1 Padden-Jones D, et al. Amino acid ingestion improves muscle protein synthesis in the young and elderly. Am J Physiol Endocrinol Metab. 2004 Mar;286(3):E321-8. 2.Â Tipton, KD, et al. Postexercise net protein synthesis in human muscle from orally administered amino acids. Am J Physiol. 1999 Apr;276(4 Pt 1):E628-34. 3. Rieu, Isabelle. LEUCINE supplementation improves muscle protein synthesis in elderly men independently of hyperaminoacidaemia. J. Physiol. 2006;575;305-15. 4.Â Koopman R, Wagenmakers AJ, Manders RJ, Zorenc AH, Senden JM, Gorselink M, Keizer HA, van Loon LJ. (2005) Combined ingestion of protein and free LEUCINE with carbohydrate increases postexercise muscle protein synthesis in vivo in male subjects. Am. J. Physiol. Endocrinol. Metab. 288(4): E645-653. *These statements have not been evaluated by the Food and Drug Administration. This product is not intended to diagnose, treat, cure or prevent ay disease.